CALLING ALL PIRATES and MERMAIDS! Posted by Julianne Johnson on Monday, September 28th, 2015 at 8:47am. Ahoy, matey! Pirates and mermaids are taking over downtown Boynton Beach! 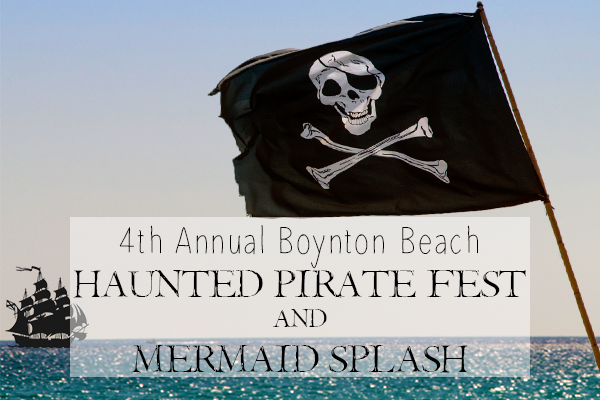 On Saturday, October 24th and Sunday, October 25th, the 4th annual Boynton Beach Haunted Pirate Fest and Mermaid Splash will take place. East Ocean Avenue will turn into a pirate haven with entertainment and activities for all ages! This two day event is free and takes place from 11am to 9pm on Saturday and 11am to 7pm on Sunday. Enjoy live music, comedians, pirate re-enactments, magic shows, stunt shows and more! There will be a bounce house, a live mermaid tank, interactive pirate ships, rock climbing and many more kid-friendly activities. But beware of the pirates! Captain Jack is known to be walking the streets of downtown Boynton Beach this weekend. On Saturday, the March of the Mermaids & Mariners will begin at 5pm. This walking parade will start at the Library parking lot on Ocean Avenue, travel east to 4th Avenue and come back down Ocean Avenue to 129 East Ocean Avenue. You won’t want to miss this colorful and whimsical parade! Wear your best pirate and mermaid costumes, or walk the plank! There will be a pirate costume contest on Saturday at 6:00pm. The four categories include all ages: Girls (under 12), Boys (under 12), Women (over 12) and Men (over 12). You can download the pirate costume contest entry form. On Sunday, all mermaids can compete in the Mermaid Pageant at 3:30pm. They will be crowning Ms. Mermaid (18 years and older), Miss Mermaid (13-17 years old) and Little Miss Mermaid (4-12 years old). You can download the Mermaid Pageant entry form. The pirates are coming! So, batten down the hatches and come out for a weekend full of family-fun!